I’ve been thinking a lot lately about how one piece of art can multiply and transform into many different versions as colorists (people who love to color in coloring books) approach the same line drawing with their own color preferences, creative vision, tools, technical skills, and experiences. The tools or media a colorist chooses to work with plays an important role in the overall appearance of a coloring. Some colorists like to mix things up and use not only a blend of different colored pencils, but also other media like watercolor, markers, chalk, gel pens, pastels and even eye shadow. Others prefer to stick with their favorite pencil brand. Either way, gorgeous results are within everyone’s reach— it just takes is time, practice, and a willingness to learn and experiment. And sometimes a little luck! 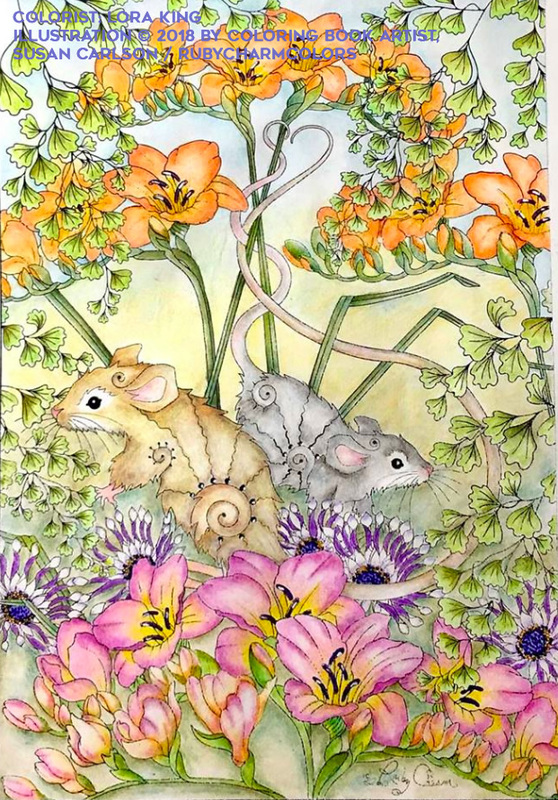 Lisa Duggan (below and here for a close-up) colored her version of Mice in Freesia using Faber-Castell Polychromos colored pencils. She tackled the background with a few layers of Tombow Dual Brush markers and a little more colored pencil over the markers. 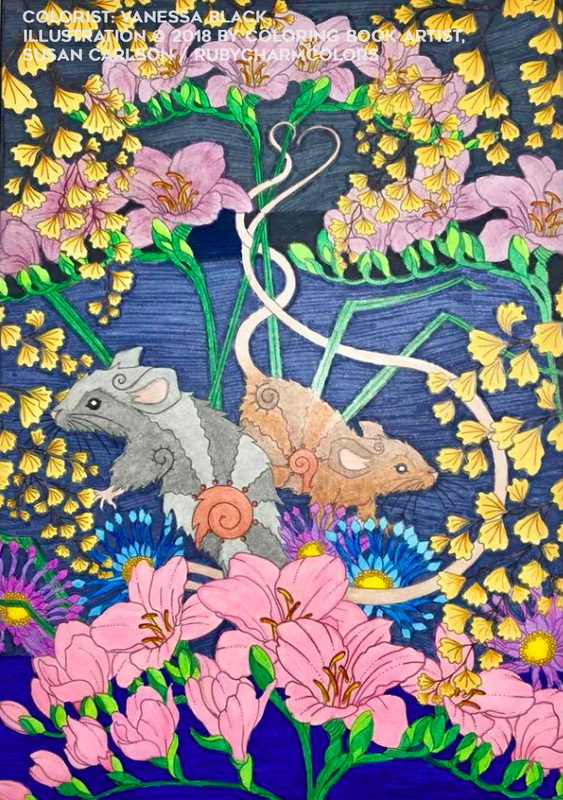 Marilyn Reading opted for a more limited choice of media and used Prismacolor colored pencils for her version of Mice with Freesia. To see more details of Marilyn’s coloring, click here. 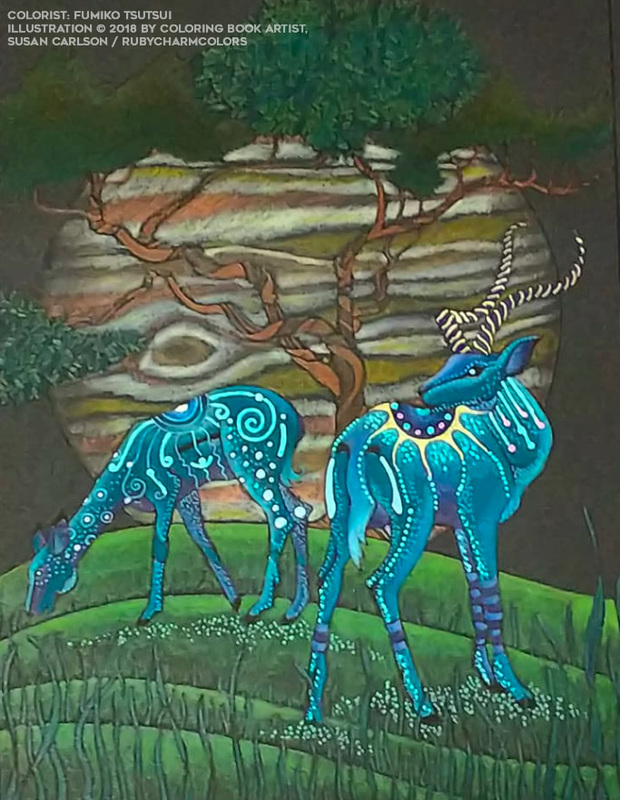 Vanessa Black opted for Tombow Irojiten Colored Pencils, Printworks Super Soft Colored Pencils, and then Faber-Castell Pitt Artist Brush Pens for her high-intensity background. Click here to see the details in Vanessa’s piece. Lora King used a mix of Hero and Holbein pencils. I don’t have great links to Hero and only one for Holbein (which can be hard to come by as far as purchasing goes). Lora also used Jane Davenport pencils and Prima watercolors, Tombow markers and even Derwent Artbars. For a closer view at how she combined all her media, click here. 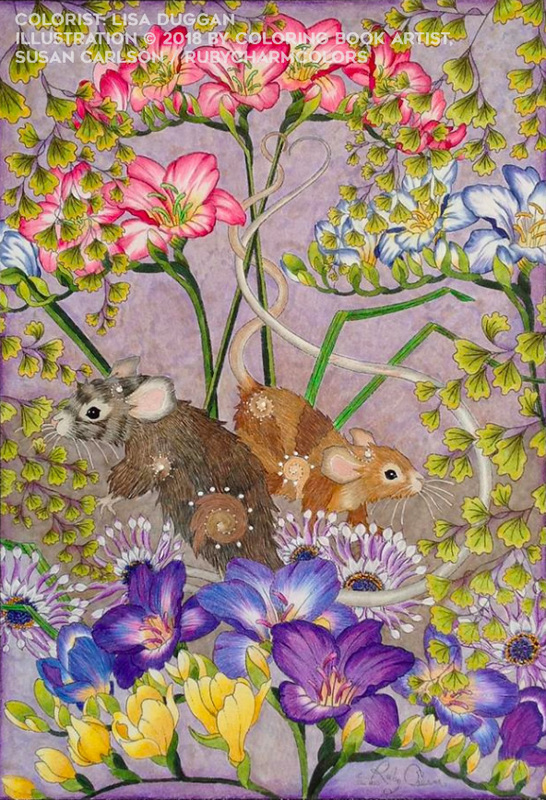 Each version of the Mice in Freesia has its own unique feel, and different elements of the design are brought forward (or pushed back) through use of color, shading, pattern, and different applications of the media. The next set of drawings are examples of colorists seeing past the lines of the original Insects illustration into completely new and original creative territory. Some may be worried by the idea of altering an artist’s work (and I have seen colorists on social media flip out on other colorists about how they don’t think it is okay at all) but I think it is fantastic! I don’t mind being the catapult if someone has a vision they want to reach in their own coloring. If my work can inspire new ideas, then I feel I have accomplished something special. I include the simple black and white illustration above the work of Fumiko and Valencia (below) so you can see how they altered the original work to fit their individual visions. Fumiko and Valencia pushing their creativity with the RubyCharmColors Insects design and coming up with two vastly different interpretations (illustration © 2018 Susan Carlson /RubyCharmColors). Fumiko Tsutsui, coloring in the “Black Magic” coloring book, veered away from the simple circles and and created her own galaxy using the circles merely as guides for her tiny dots and stars. This gives her Insects a timeless, almost alien feel as they float through space. I believe Fumiko works mainly with Prismacolor and Irojiten pencils, but I am not positive. I believe she also uses Sakura gel pens to add embellishments. You can take a closer look at her work here. Hot off the press! 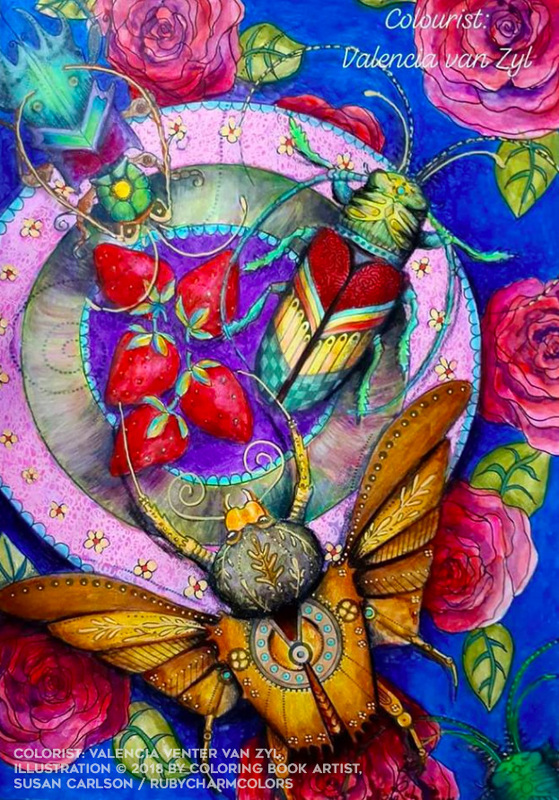 I also wanted to share Allison Capelle’s version of Insects which she just posted today. Allison used all Polychromos for the insects and Caran d”ache Neocolors II for the background. She achieved an intensely saturated, jewel-like feel to her completed work (and you can view a larger version here). 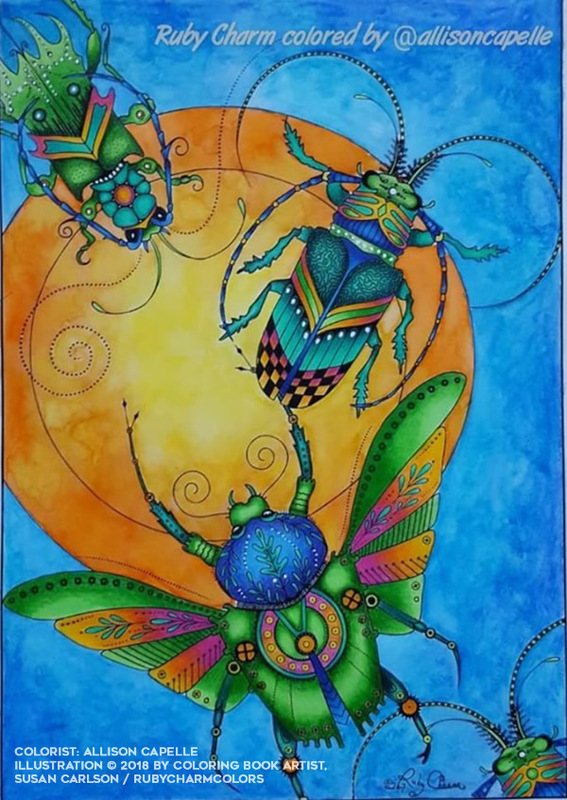 Allison Capelle’s coloring of the Insects (illustration © 2018 Susan Carlson /RubyCharmColors). All of these colorists have beautiful, individual approaches that bring the original art to new levels. As an artist, I find this very exciting and feel that there is a collaboration between creatives not typically found in other art forms. When we see a painting in a gallery, or a sculpture on a table, or view photos or films, we participate to a degree, of course. But not to the extent people interact with the art in the adult coloring book world. Colorists take the line art—the basic framework—and transform it through their own creative lens. They truly involve themselves—physically and mentally—in the art. Adult coloring as a hobby is sometimes ridiculed for being childish, but those who ridicule may not be looking close enough to see the beautiful art that’s being produced by colorists around the world. And they may not understand the truly therapeutic effect putting a pencil (or other media) to paper can have. For me, coloring or drawing puts me in a state of focus I don’t find elsewhere. Keen focus. And at the same time, a state of catharsis. My mind feels clear and sharp, and overall I feel relaxed and more centered. A sort of yin and yang effect. Coloring can be “mindless” but it can also be mindful. This next batch of colorings (above) have unique qualities, too. 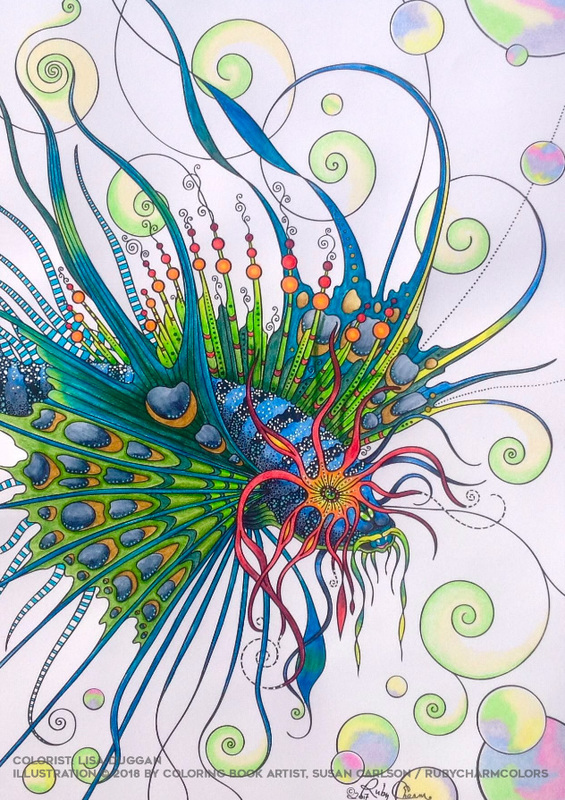 Lisa Duggan colored two different versions of the Lion Fish design. Her first version (a close-up here), was colored in September of 2017, and she used Prismacolor and Polychromos pencils. 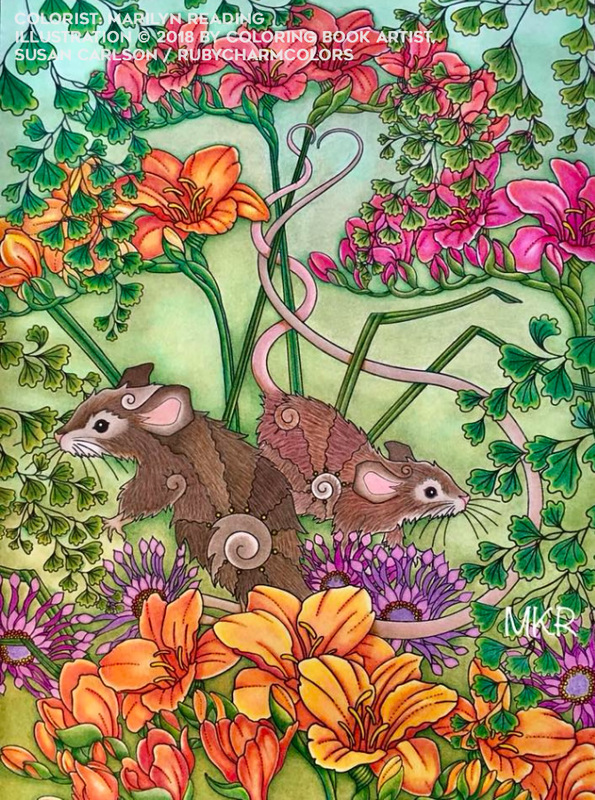 In her second version (completed more recently), Lisa used Derwent Inktense, a little layering on top of that with Polychromos, and then added embellishments with gel pens. Click here for a close-up of Lisa’s second coloring. 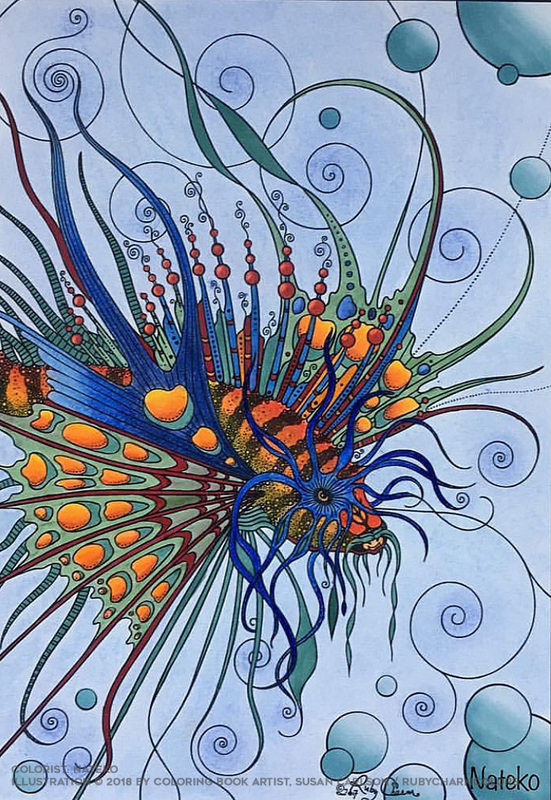 Her color choices for the Lion Fish and the background uniquely alters the mood of each version. Lora King, fairly new to coloring on black, colored her Lion Fish (click here for close-up) from the “Black Magic” coloring book by using five different pencil brands—Pablo’s, Polys, Prismacolors, Irotijen, and Heroes—plus she experimented with chalk, Caran d”ache Neocolors II, Faber-Castell Pitt Artist Brush Pens, and a Zig Clean color brush. 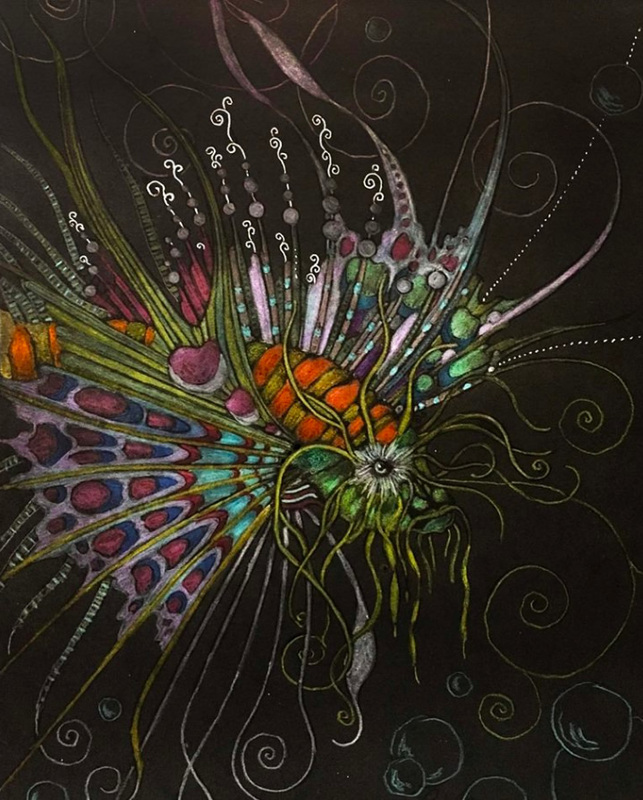 While chatting back and forth about the piece through social media, she expressed a little frustration about the learning curve when coloring on black (it is not easy) but I absolutely adore her Lion Fish and the rich, almost metallic pops of color she’s got going on. It almost looks like a painting! Nateko used aquarelle pencils for her version of the Lion Fish though I am not sure if they were Faber-Castell or Staedtler aquarelles. You can view her close up here. Again, the media we work with can make a huge difference in the overall look and feel of a piece. And I probably say this more than I need to, but never be afraid to experiment! Even if a coloring turns into a disaster, there were probably some useful skills learned in the process. Here’s another set of colorings that beautifully highlight the variety of work being done by colorists working with the RubyCharmColors illustrations. This is Gazelles. 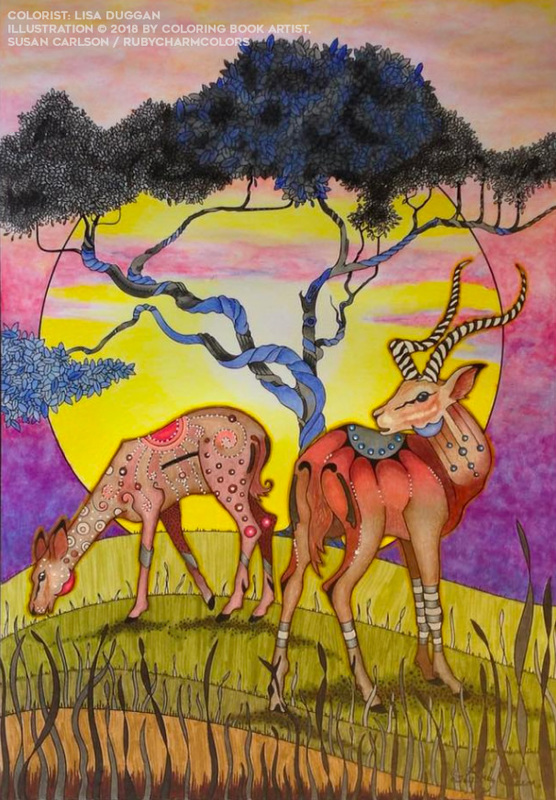 Lisa’s warm hues, blending of the sky with a few hazy clouds hanging in the air, and her coloring technique effectively brings us to the African savanna (see close-up) while Fumiko’s blue gazelles and and striped planet looks like a mystical scene from Avatar (here’s her close-up). On Instagram Lisa commented that Fumiko’s coloring looks like night photography and I tend to agree. Both colorings are uniquely beautiful! Now this is pretty cool … same colorist, different versions of the original line drawing: one was printed in black while the other was printed at about 50% grey-scale. 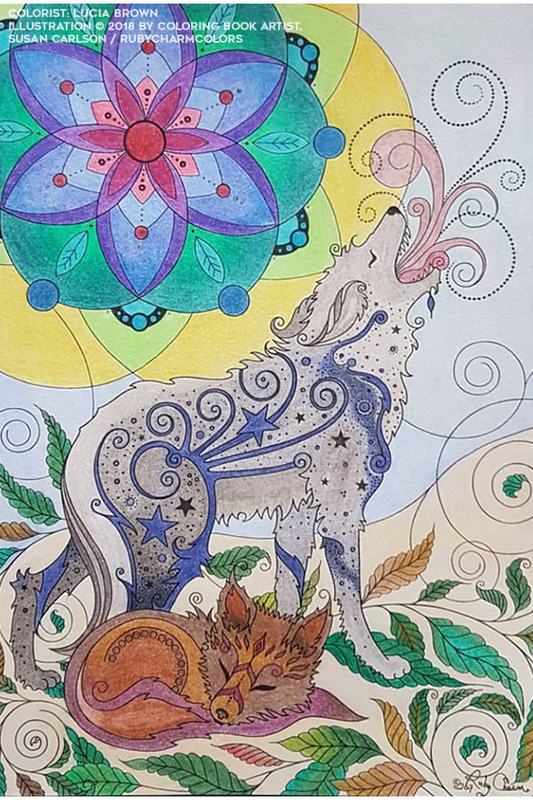 Colorist Beth Hovey told the RubyCharmColors group on Facebook that she used the Sun & Moon illustration as an art lesson for her granddaughter! After coloring the black line version, she printed out the grey line version to help her granddaughter understand how black lines and gray lines can have an affect how a coloring turns out. She used the same color palette for each version—and even though she said the purple pastel chalk on the black line coloring was applied a little heavier—we can still see the nuances between the two different versions. Coloring the grey line version (which I include with all of the PDFs I offer on Etsy as a bonus) puts more emphasis on shapes and colors and less emphasis on the sometimes heavy black lines themselves. Working with grey line versions can also make it a little easier to veer from the original design and add more of your own details since the lines are much lighter and easier to color over. And you don’t have to have a grey-line PDF to do this. Depending on your printer’s settings, you can can either choose “Greyscale” or even print at a lower “economy” setting which spits less ink on the page (if you have an inkjet printer). Laser printer? Not sure … but you can always poke around your printer’s settings and try a few experiments. The next three images are from colorists Sandy Kinzer, Lucia Brown and Paula Leach, each working their own magic on the same image. Here, it’s all about the color combos. The simple butterfly design was offered as a freebie through the RubyCharmColors group on Facebook (you need to join and participate to get the freebies) as a teaser and as a practice run for the more complicated “Butterfly with Spheres” design that was released shortly after as a downloadable, printable PDF. Sandy’s butterfly feels like spring with a lovely mix of pastels and a few bright colors we associate with the season of growth and awakenings. Lucia’s butterfly uses a pallet that is a little more limited, and her use of pinks and turquoise create playful, modern looking contrasts. The close up of Paula’s butterfly in more muted tones above shows the metallic, glittery pens she used to embellish some of her detail work. 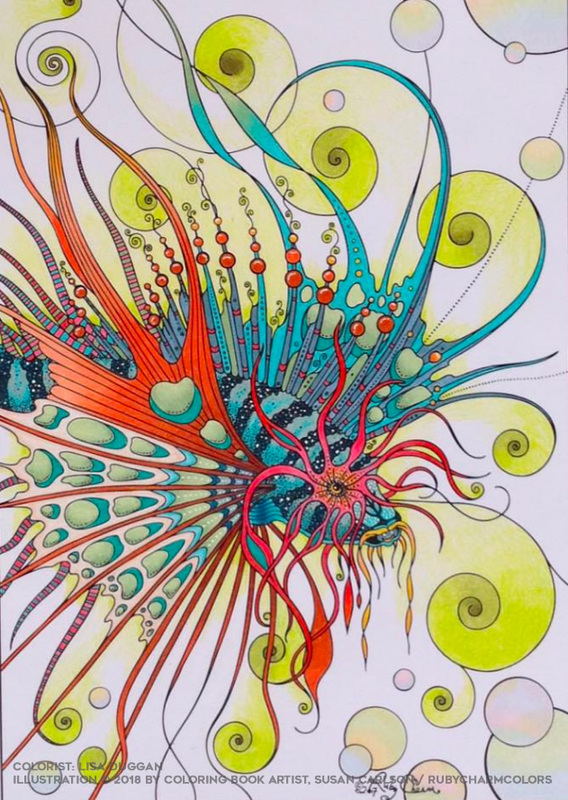 Below is her coloring of the full version of “Butterfly with Spheres.” Her color pallet is intentionally limited and gives the piece a soft, romantic unified look. Having a little time to think about colors before approaching a final piece can be helpful. And being able to experiment with different media on a more simple piece before committing to the final can take away some of the pressure, too. Not everyone is concerned about the final outcome (and that is perfectly fine), but there are a lot of colorists who are, and who want to keep learning and pushing themselves creatively. Now how about these rabbits? Again, color changes everything! 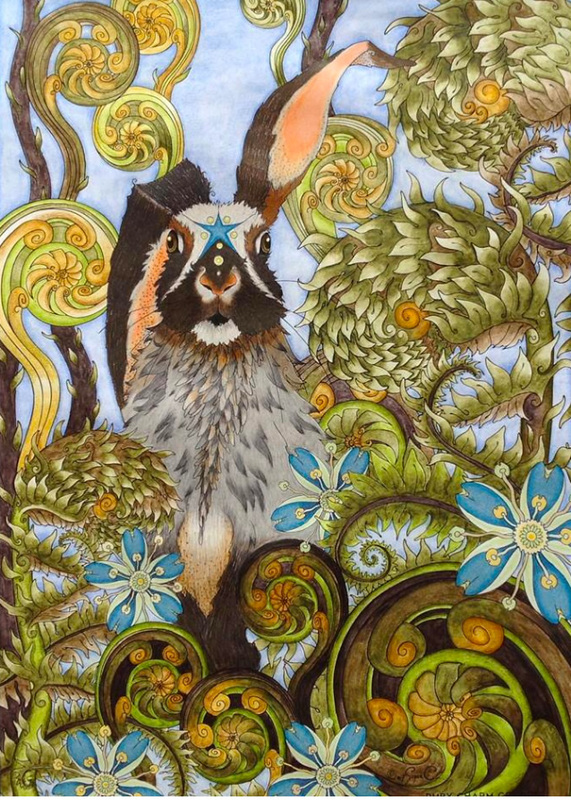 These three colorings below are of the Spring Rabbit illustration. 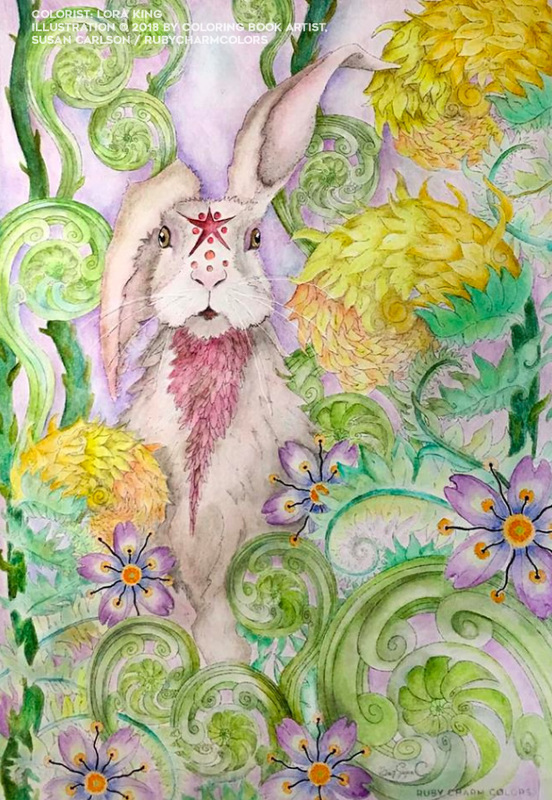 Lisa (close up here) used Polychromos pencil over her layers of Derwent Inktense, and also used Prismacolor pencils for the rabbit and flowers. 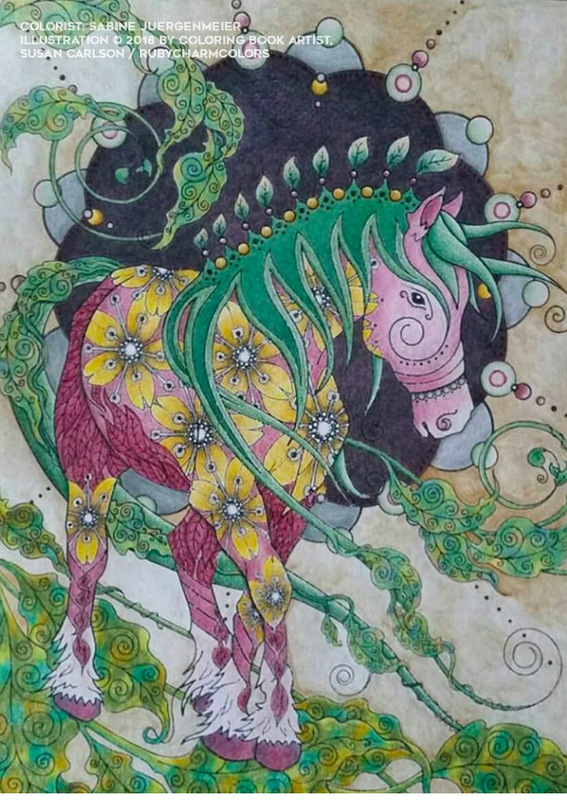 Lora (close up here) used a mix of Hero, Holbein & Caran d’Ache Pablo pencils with Royal Talens Angora watercolors. Both colorists created compelling, balanced and lovely final pieces. 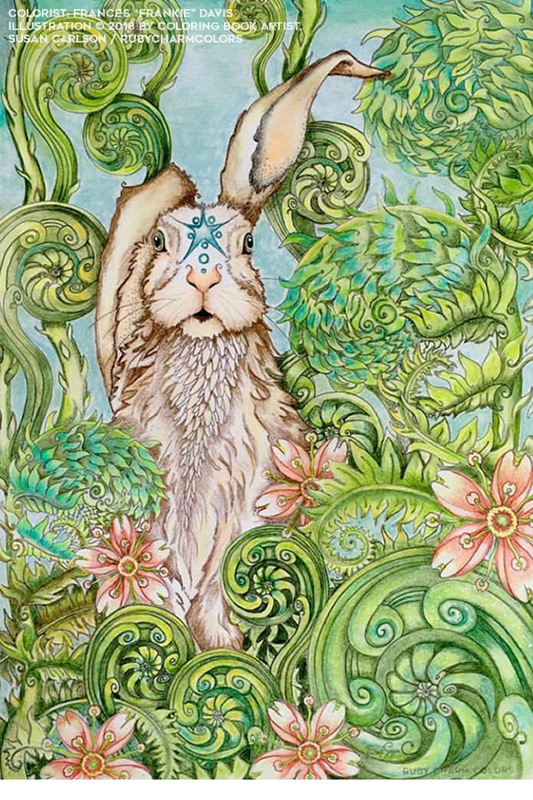 Frankie used Conté à Paris Pastel pencils and Polychromos along with a white Posca pen to complete her beautiful rendering of Spring Rabbit. If you’d like to see a larger version, click here. The Coyote & Fox illustration (below) is one of my favorites as it is one of the first I drew specifically for coloring book pages. 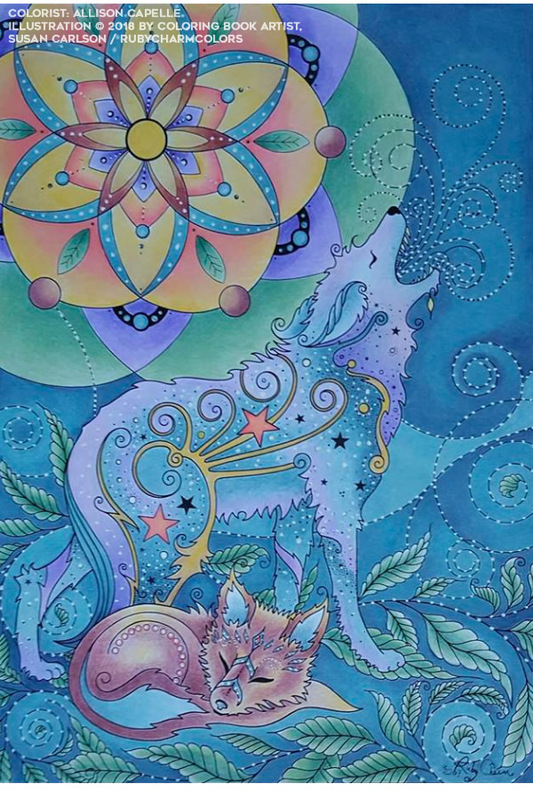 Both Allison and Lucia approached the design with different visions—Allison and her Tombow Irojiten Colored Pencils created a mystical evening scene (close up here) and Lucia, using a mix of Derwent Colorsoft and Faber-Castell Polychromos pencils, created a brighter scene where the mandala-like “sun,” the fox and the leaves pop out of the background (close up here). I can’t tell you how exciting it was for me to see these appear on Instagram when I was starting my Etsy business last year—so inspiring! 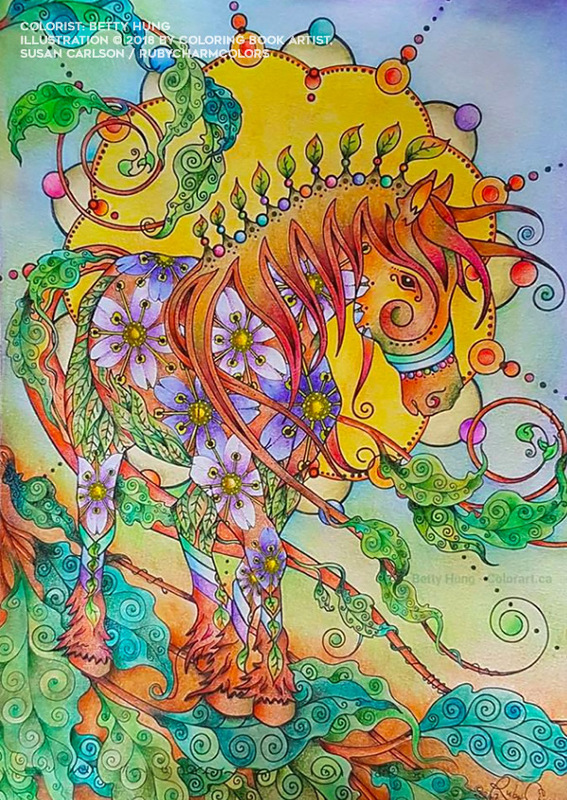 Horse with Flowers is a more recent drawing, and I have three colorings I’d like to share though I know there are more floating around out there. 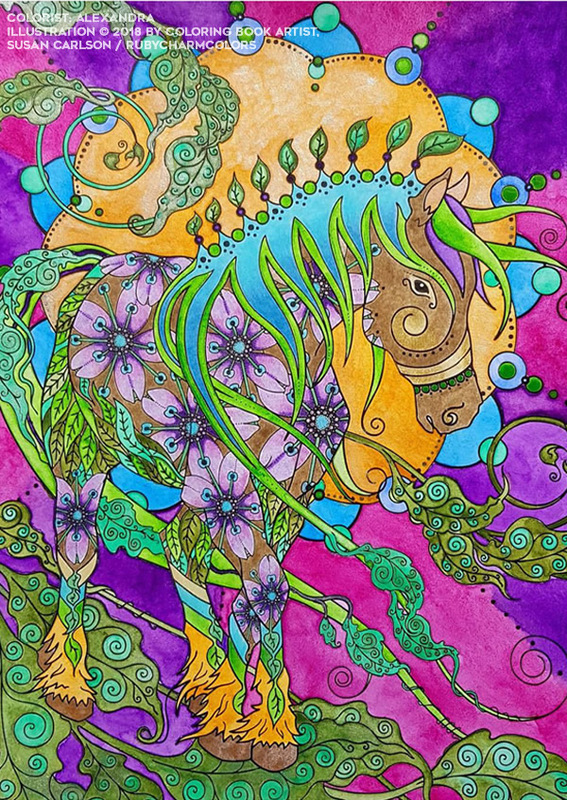 Betty Hung, a colorist and blogger (check out her beautiful and helpful blog about coloring here) used Chameleon pens and Colortone pencils in her beautifully balanced piece. Her blending of the background is soft and exquisite (zoom in here). Alexandra used a wide variety of media including Caran d’Ache Museum watercolors, Luminance, Prismacolor, Faber-Castell Polychromos and a Wink of Stella to achieve her highly saturated coloring (close up here). Below Betty and Alexandra is the Horse with Flowers colored by Sabine Juergenmeier. Sabine used gold watercolour for the background and a collection of different brands of pencils including Faber-Castell Polychromos to achieve a beautiful muted color pallet that almost looks like it was painted on a marble wall–a very lovely effect than can be seen more closely here. Last but not least I wanted to share this collection of Luna Moth colorings. Not only are there wide varieties in color scheme, but also some departures from the original Luna Moth illustration that make each one unique and attractive. 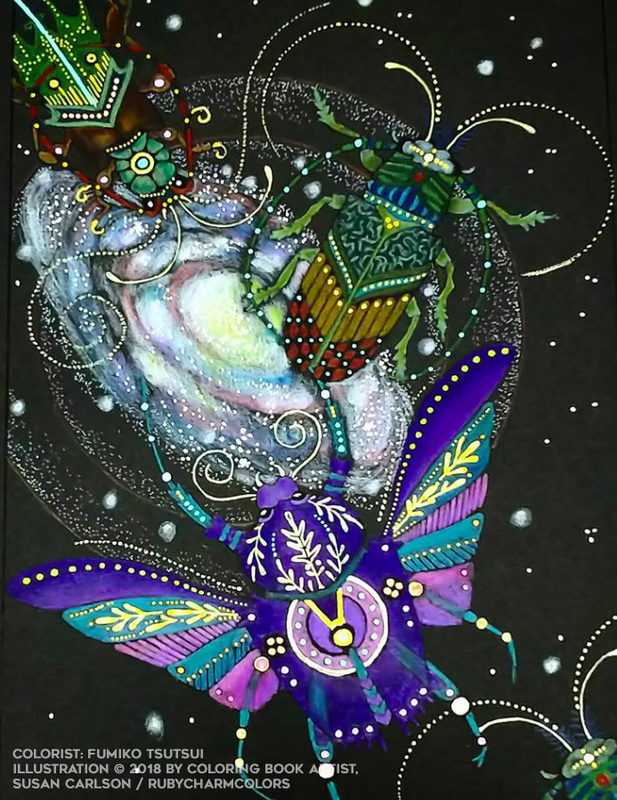 The process Betty Hung used for her Luna Moth is detailed in her blog, Color Art, and is worth a visit and subscription. There are so many other colorings I’d love to include in this post, and so many wonderful colorists that I’d love to tip my hat to, but I’ve run out of time. I would love to do this again in a few more months, though, so keep those colorings coming, please use the #RubyCharmColors hashtag on Instagram, and please tag RubyCharmColors on Facebook. I’d really love to see your work! A big THANK YOU to all the colorists willing to share their work and joy of coloring with us all! Show them some love and give them a follow on Instagram! Susan…it’s 8:15 here….after a very long, exhausting day. Just sad down to catch up on email and Facebook…took a deep breath, sighed..and came across this. My goodness!! I almost feel that I’m sitting in my living room with my favorite artist…You, going through your renderings, colored so beautifully by so many extremely talented colorists. You’re not only an amazing artist, but a wonderful instructor. Thank you so very much for sharing your talent with all of us!! This is spot on with how and why I color. I love to create, I equate it to yoga, and to say “I did that!” And with the help of artists like you, my world is a brighter place💖 Thank you so much for sharing your talents with us! Thank you, Allison! And thank you for sharing your gorgeous colorings–that makes my world a brighter place! I like the idea of equating it to yoga – there are definitely benefits like mindfulness, relaxation, etc. … though I think there may be a few drawbacks, too (the cost of a pencil and art supply addiction being the first thing that comes to mind, lol).